This is Ang Temba calling from Kathmandu. Today we did our city tour of Kathmandu and it was quite a nice day. 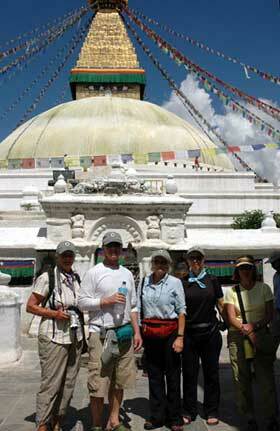 We visited three popular holy places in the city this morning, the Monkey Temple, Pashupati Temple and Bodnath. We then had lunch at the Hyatt hotel. After lunch some of the members then went shopping in Thamel. Anyway we had a really good time and good day. The team members are really happy and excited to start trekking. Tomorrow we are heading to Lukla very early in the morning. If the weather is good will begin trekking by 8:00am tomorrow morning. That is all for now, we will report again from Namche.